First-year resident Austin Fain, center, shadows RN Jimi Killen for a morning in the Medical Unit at Poudre Valley Hospital as part of the residency program there. Photo by Kati Blocker, UCHealth. 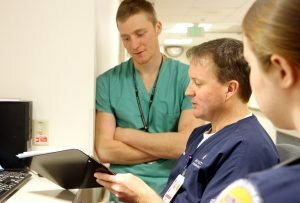 After only a few hours working the floor as nurses, a handful of aspiring physicians realized their hospital colleagues handle a lot more than they ever imagined. “I was amazed by the logistics of their workflow and how they prioritized all their patients’ needs,” said Beth Johnson, a first-year resident with the UCHealth Family Medicine Residency Program – Poudre Valley Hospital. Early on a Tuesday morning, seven first-year residents — fresh out of medical school — met with Transitional Care Registered Nurses Andrea Hooley and Jennifer Nolte to discuss the plan for the day. Each resident would be working with an RN that morning — not as a provider, but as an observer. The residents arrived to meet their respective nurses after the 7 a.m. shift change. Resident Austin Fain watched Registered Nurse Jimi Killen look over the charts for the medical unit. Killen explained how he looks for sepsis markers, described how he scores patients and the tools he uses when the unit becomes exceptionally busy. Killen has worked at PVH for five years. He participated in the shadowing program last year as well. That point wasn’t lost on the residents, who debriefed with Andreen and the Transitional Care nurse team after their morning shift. To this end, the residents related thoughts on how to use that patient-nurse relationship to help improve patient care. 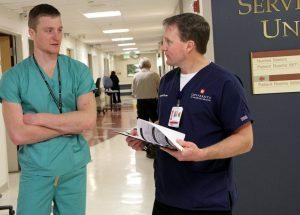 PVH Medical Unit RN Jimi Killen, center, discusses his job with shadowing first-year resident Austin Fain, left, and UNC nursing student Julia Knox. Photo by Kati Blocker, UCHealth. The group discussed document flowsheets or possible rounding solutions to foster that communication between nurses and physicians. Another resident said they weren’t aware of SBAR until that morning. SBAR — or Situation, Background, Assessment, Recommendation — is a tool nurses learn in school to effectively communicate to doctors and other medical professionals the status of a patient or their situation, Andreen explained. The residents agreed they could use this tool by asking a nurse to give them the “SBAR” when things become unclear during a conversation. The residents also realized how they may be able to make nurses’ jobs a bit easier as well — at least when placing orders. “I learned that if I can just put in diet and pain medication orders, and code status for new admits, it would make the nurse’s job a lot easier,” said one resident in the debriefing. An order is much more than just pressing a button, they agreed. It was something that resident Anna Bagby learned last year while shadowing a nurse and has adopted into her daily practice as a second-year resident. “After seeing the nurses run back and forth to fill different orders, I decided that I would keep in mind the timeline,” she said. “It seems so simple, but making sure I put in orders at the same time so that medications can be taken together is important, and it was something I ignored before shadowing.